With the recent global recession, the world economy has changed forever. The old tools — most notably supply-chain management — are no longer enough. The new challenge is to locate and capture the elusive pools of high-profit demand. 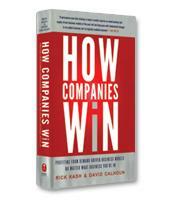 In this executive summary of How Companies Win, Rick Kash and David Calhoun have the answer: a revolutionary, demand-driven model that has already proved successful for some of the world's most admired companies, including Best Buy, Anheuser-Busch, Hershey's, and Allstate. How media companies, retailers and manufacturers work together to serve demand with much greater precision. What it takes for companies to win in a new era of heightened global competition. How to engage every level within a company, small or large, local or global. How to find real-world solutions that take advantage of the rise of social networks.